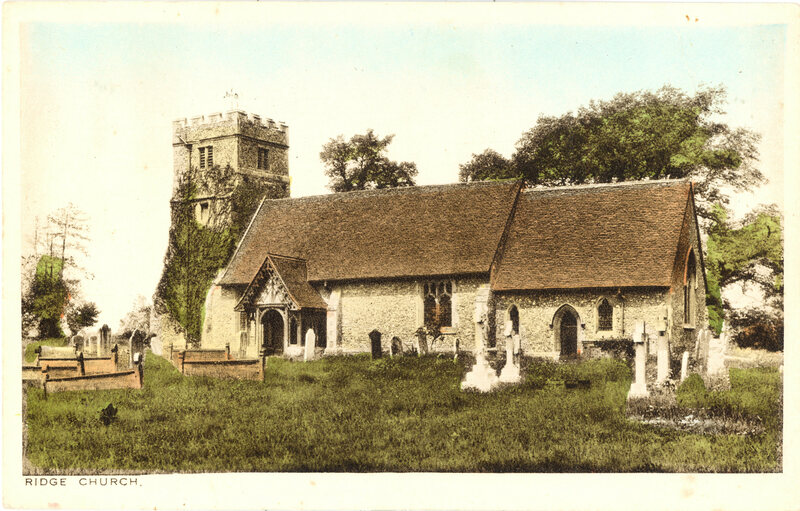 The church of St Margaret is a small building of the 15th century, and consists of chancel and nave, south porch and an embattled western tower containing 3 bells: in the chancel is a memorial brass to Catherine, Countess of Caledon, d. 8th July, 1863, and a tablet inscribed to Lady Busby, wife of Sir John Busby kt. 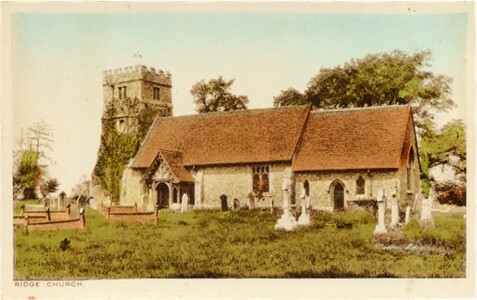 of Addington, Bucks ob. 1661: the tower was restored in 1876 by the landowners of the parish at a cost of �0 and in 1885 the church was restored and reseated at a cost of �00: there are 120 sittings. ... Rev. William Th. Clarke, A.K.C. 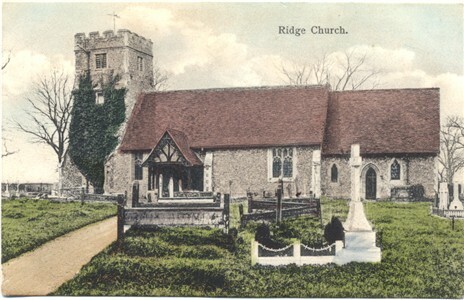 Vicarage. "We prayse God for all His mercys. 1633"
At each corner of the slab is a coat-of-arms. There are several tablets on the walls, one of which is to the memory of J. Yorke, Esq., third son of the Lord Bishop of Ely, who died at Tittenhanger, in X816, aged 19; another is to the memory of the Rev. John Willis, a former Rector, who died in 1799, aged 78; and there are others to members of the Bushman, Jennings, and Busby families. 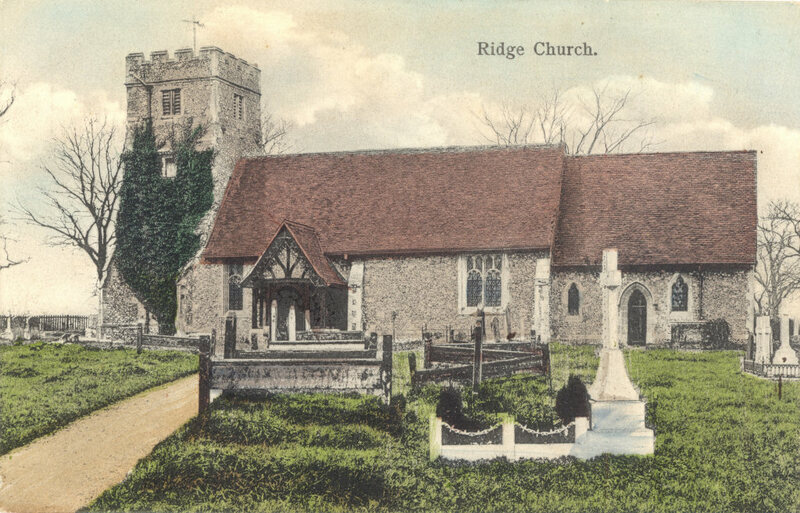 The Church is in a neglected condition in the interior, with old-fashioned and irregular pews; there is a slab on the chancel floor which has contained brasses, but to whom is not now traceable. In the Churchyard are some very sumptuous monuments: a sarcophagus of white marble is to the memory of John Trotter. Esq., late of the 2nd Life Guards, and of Dyrham Park, near Barnet, who died October, 1870, aged 62. A very handsome tomb is to the memory of Lydia Emma, wife of George L. T. Lane, C.B., R.A., who died in 1874, aged 66; and another to Rev. W. Pennyfather, B.A. The living is a Vicarage, of the annual value of �0, in the patronage of the Countess of Caledon. The Register begins in 1558. There are five Almshouses, founded by Miss Jane Trotter, of Dyrham Park. The children of this Parish are educated at the National School of South Mimms. The population is 448, and the number of acres 6059. Home Counties Public House Trust Ltd., (Joseph John Cole, mgr. 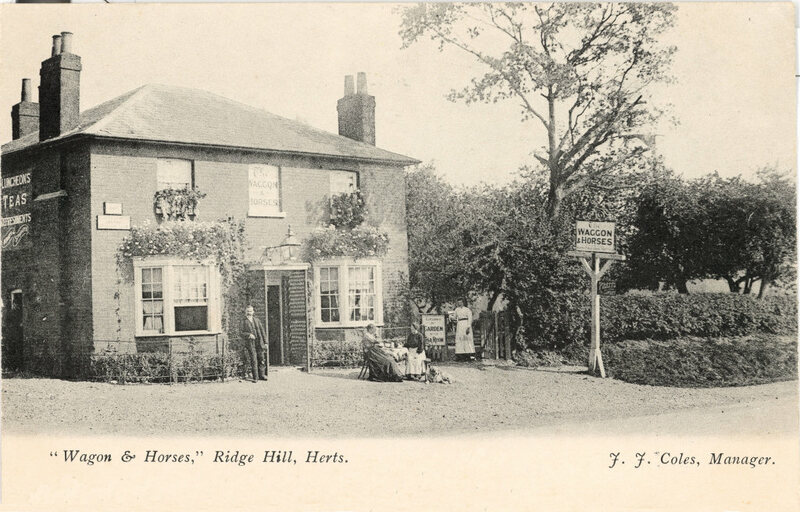 ), Waggon & Horses P.H., Ridge Hill. 5 Sept 05, Dear Mother, Another for your collection. Thousands at the [Barnet] Fair which originated from the Mayor of London in the year of 1666.